Community Managers need to know heroes. It is my second time to attend OSCON (open source convention) by O'Reilly. There were many nice sessions, tutorials, funs, and after parties. One of my favorite presentation is "Let them be your heroes" by Francesca Krihely (MongoDB). It is an awesome talk. I have never thought to find heroes and nurture them in a community. But now I understand the importance of heroes as a community manager. Using Open Source Software at an Internet Company and Hacker Culture. 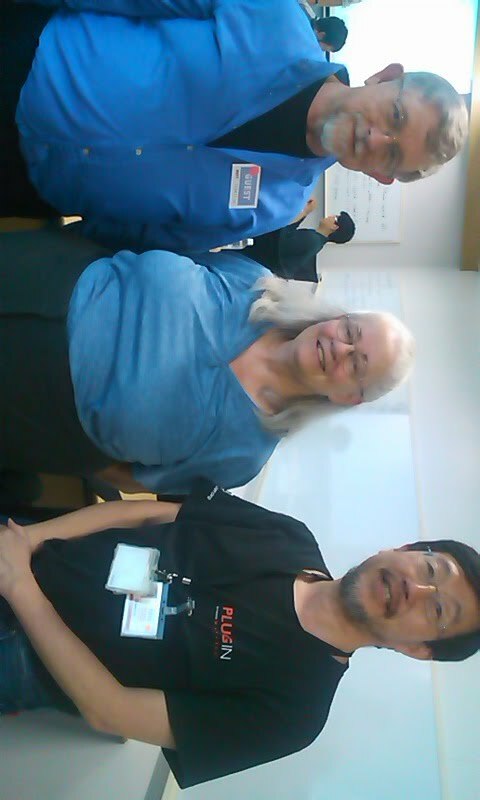 I made a presentation, "Using Open Source Software at an Internet Company and Hacker Culture" at Linux Enterprise Users Meeting held on December 11th, 2013 held by Linux Foundation. I followed his explanation and click them. What you need is 1) github account, 2) heroku account, 3) Facebook account, that's it. 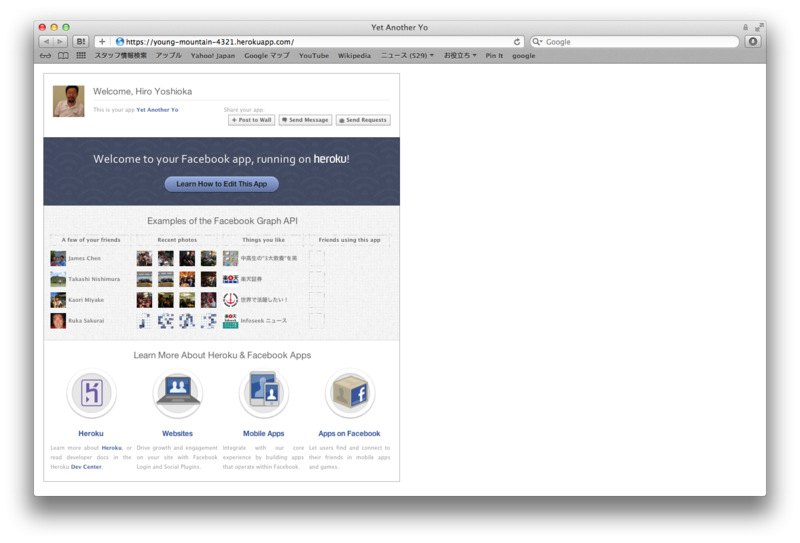 You could make a Facebook application without any coding. very simple. The application which I made in Five minutes is the following. 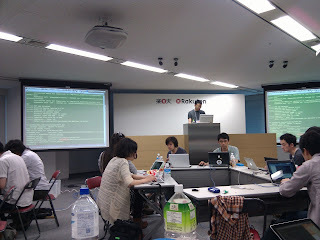 It is a tutorial of Facebook application. Enjoy building your own Facebook application. 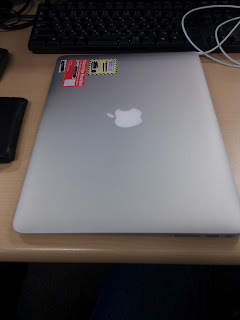 I am using Mac Book Air since last friday (April 13, 2012). Although I used Mac and Powerbook in early '90, it is the first Apple product in 21 century. I don't use iPod, iPhone, iTunes, iPad, nor any of Apple products. 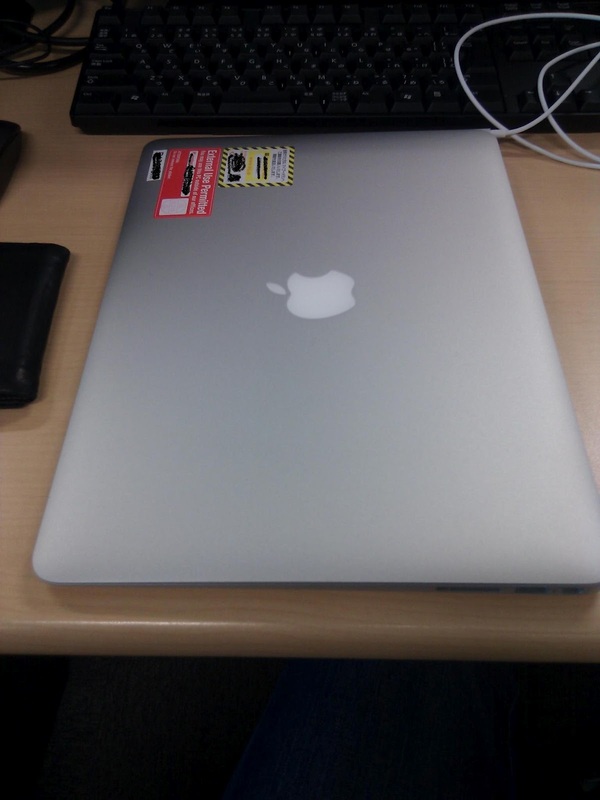 Last weekend I set up new Mac Book Air (mba, here after). By the way, it is a corporate computer so I don't pay it. I had wanted to make software development environment, so did google. I learned Xcode is popular tool. So I tried to download and install it. You need Apple ID to download it. What is Apple ID? You need to register developer's site to install it. In order to register Apple ID, you have to provide your name, address, birth of date, telephone number and/or credit card number, and so on, to Apple, Inc. In order to register developer's site, you need to provide your Apple ID, affiliation, interests, development OS, products information, many personal information to Apple, Inc. I have a netbook which is built by Asus. When I started using it three years ago, I did not accept Microsoft agreement which means that Windows were erased from my netbook and I didn't use Windows on it but I installed Ubuntu. So I have never provide my personal information to any companies, like Microsoft nor Asus. I like free software. Because it is free. It means freedom like freedom of speech. I was shocked that I have to provide my privacy to Apple, Inc. I just want to use this mba but if I want to use it, I have to pay my privacy. It is not free. Now I understand Richard Stallman never uses Apple products. 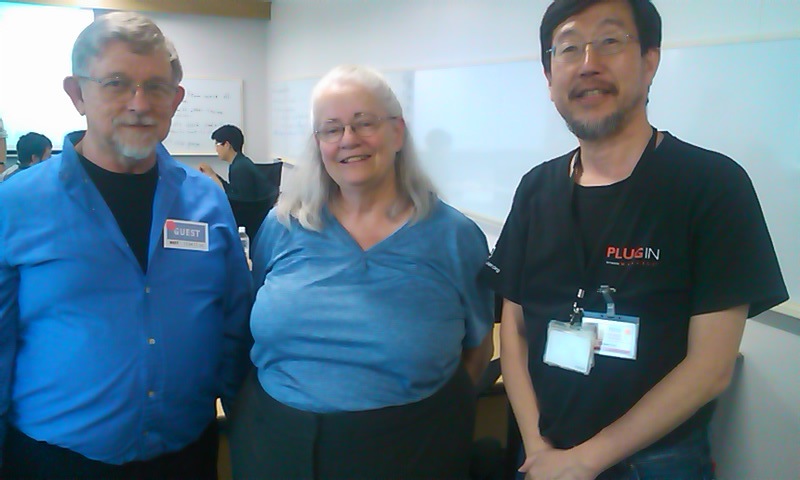 Today we have a workshop led by Tom and Mary Poppendieck who are well known lean software development experts. The workshop is in English without translators. 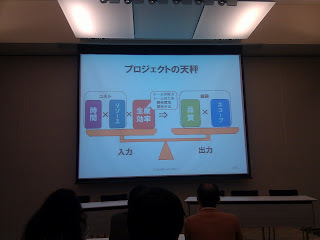 As I wrote the previous blog, our company's official language is changing from Japanese to English. There are good things and bad things without translators. Bad things; you may have some difficulties to understand what Tom and Mary said. You may misunderstand them. It is very difficult to ask in English. Good things; You don't need translators. The translation are expensive and sometimes wrong. Communication speed are much faster than having translators. Poor English is better than translator's translation . You may disagree with me. But my belief is a dialog with poor English makes you clear and concise understanding between each other. Because you have to think about subject very clearly to translate your idea from Japanese (or your native language) to English. If you don't understand what you are talking, you can not translate it to English. Anyway, Englishnization gives a lot of opportunities for us. I'm really exciting about this company's transformation. I learned this quote from Kawaguchi san and he learned from Hiranabe san who attended Mary's keynote speech about lean software development. This is very exciting moment for me. Rakuten is known as a Giant EC company in Japan but it is not well known in the world. I am an employee of Rakuten. Two years ago our CEO said "we will use English as a company's official language" when we had a weekly all company meeting on Monday morning. Very few Japanese companies use English as an official language. Some of hardware manufactures such as Sony and Nissan are using English but their official language are still Japanese. It is very radical decision. There is no other choice if a company wants to be a global company. Two years ago many of us were not good at English and still struggled with it. We have to pass an English examination. I had never took TOEIC (English examination) so I did not know if I had good enough skill. Fortunately I passed the examination. 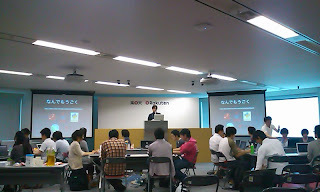 Many meetings are running in English now and we get used to use English. Average score of TOEIC are increasing in this two years. We use English in our internal SNS. We can exchange our internal information not only Japanese employees but also non Japanese speaking employees in the world. Last month we had an internal training by Jonathan Rasmusson at Rakuten. No translation was provided but many of us enjoyed it. Many questions was asked in English. If we can use English, we can learn the leading edge technology. Learning English is our great opportunities. English is the language of Internet and the global economy. We are learning the business of Internet services and it is very exciting thing. Our experience of Englishnization will be a good role model of being a global. How do we change our language to English? I'm enjoying this experience. All of the presentation except Jonathan are case study of each project. 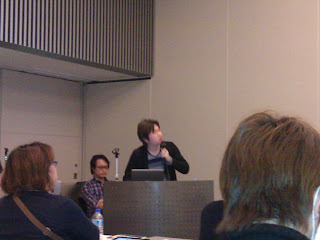 Many tacit knowledge were published and discussed. 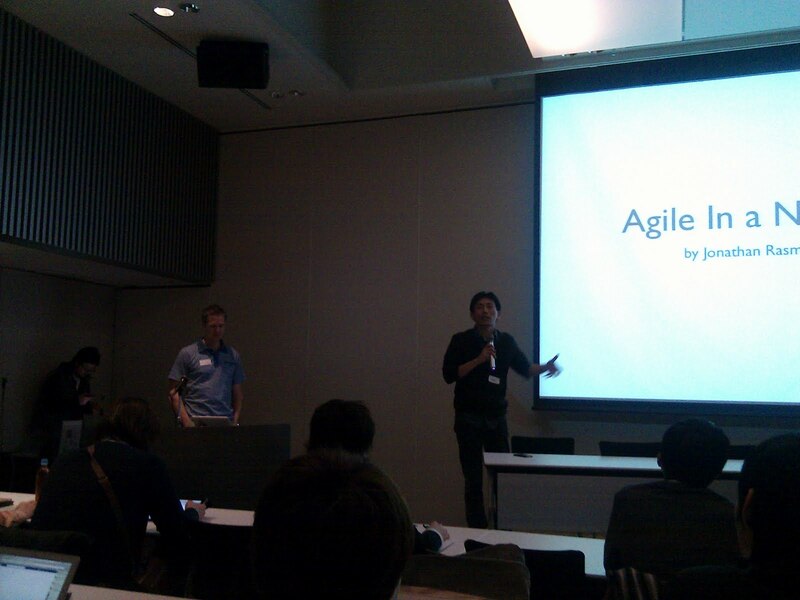 There were many scrum masters and we exchanged our experience. I think this kind of meetup are very important and valuable. We can learn from each other and exchange our best practice, do/don't, good thing, bad thing and so on. The after conference party was really good and I enjoyed so much. I would really appreciate DeNA who made the conference, speakers, and participants. I'm running a study group known as Kernel Code Reading Party since 1999 with friends of YLUG (Yokohama Linux Users Group). I am a technical evangelist at Rakuten, Inc.